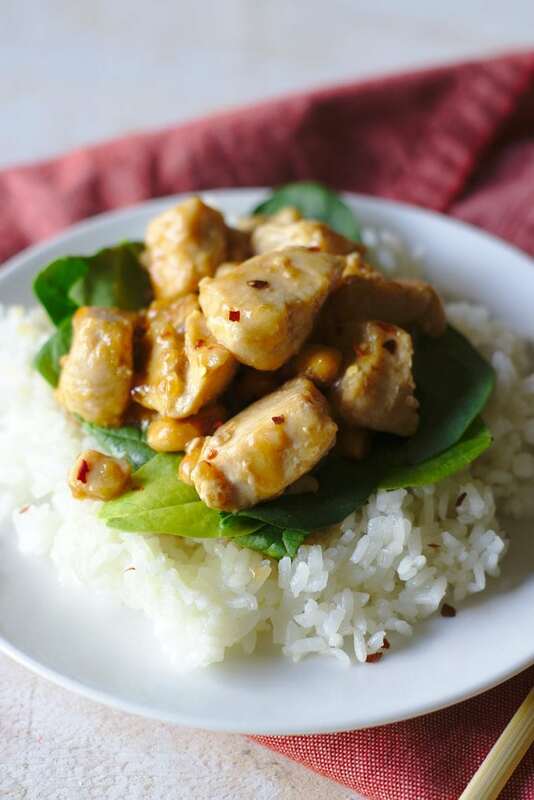 Kung Pao Chicken is a quick and easy takeout meal made right at home! 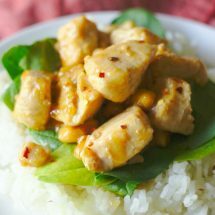 Spicy kung pao sauce over chicken and peanuts is great served over rice! Takeout Chinese or stir-fry recipes are a go-to for me on busy weeknights! I love the flavors of Chinese takeout but it adds up and is packed with salt so making it at home lets me make it a little healthier and save money! 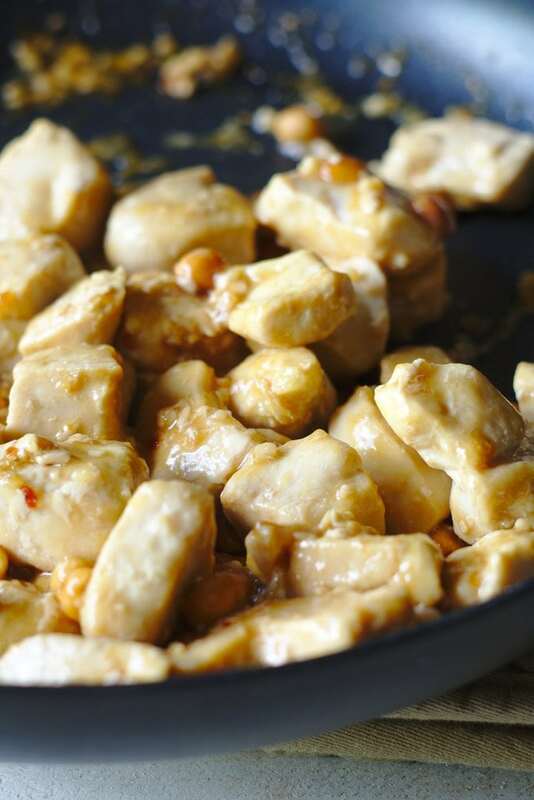 This kung pao chicken recipe is a favorite at my house, we love the flavor and it takes just a few minutes to whip up start to finish! Now this recipe can be easily turned into a stir-fry. Some of my favorite vegetables to add to it are broccoli, baby corn, carrots, mushrooms, bok choy, asparagus, etc. Just pop them in with the chicken and let them cook until tender. My favorite way to serve kung pao chicken is over white rice but the noodles are fantastic too! The recipe makes extra sauce so there is plenty to coat your rice/noodles with! Additionally, if you want a more traditional kung pao sauce, then use the dried chilies but if you like a more mellow, less spicy version, then use the red pepper flakes. If you want to make a breading for the chicken, check out the recipe below! Preheat oven to 375 degrees and line a baking sheet with aluminum foil. Place chicken and beaten egg in a Ziploc bag and close. Shake until chicken is well coated. Transfer each piece of chicken into the breading bowl and completely coat with breading. Place each piece of chicken on the lined baking sheet and spray chicken with cooking spray. Bake for 10 minutes. Set oven to broil and cook for 2 minutes more before removing baking sheet from oven, flipping chicken and spraying with more baking spray, and bake for another 2-3 minutes. Once the chicken is done cooking, continue to step 3 of the full recipe below. Want more take-out favorites at home? 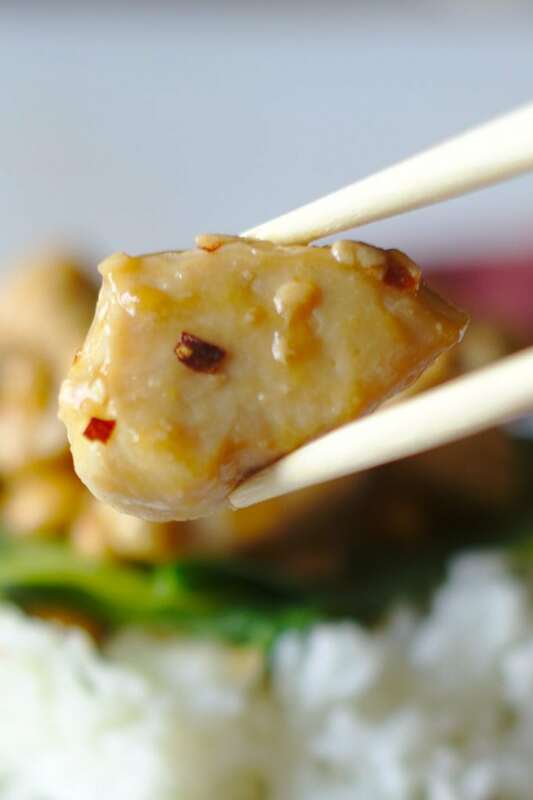 Slice chicken into 1-inch cubes. Place in a large pan or wok with sesame oil over medium heat and cook until one side of the chicken cubes is brown before flipping over and continuing to cook. In a small mixing bowl, combine minced garlic, ginger, soy sauce, sugar, vinegar, water, and cornstarch. Mix until well combined and then pour sauce into the pan with chicken along with peanuts and chilies. Cook for 2-3 more minutes or until chicken is fully cooked through. Serve over rice topped with sesame seeds and green onions (optional). 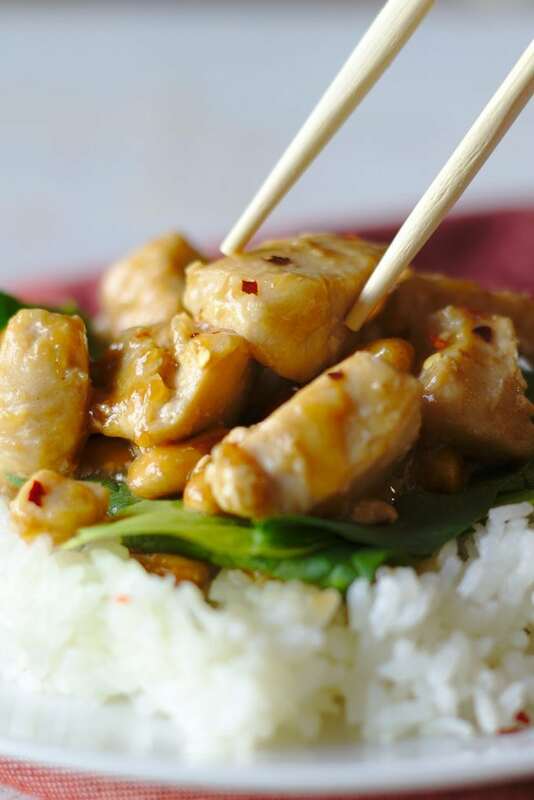 Make sure to check out these amazing Asian-inspired recipes!